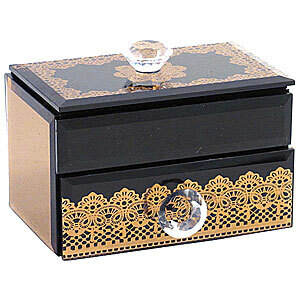 A highly decorative Mirrored Jewellery Box - Bronze (Box height 10.5cm x length 12.5cm x width 8cm). This will make an ideal small jewellery box or bedroom storage place for all your easy to lose little items. Each bronze mirrored effect box contains a slide out drawer, with clear crystal type handle, and a lift up hinged top for your jewellery. The underside of the top contains a mirror and all the insides come with a soft black felt lining to keep your rings and necklaces safe. A great bronze and black jewellery gift box for someone special. Go on treat yourself.